Working together sure isn't what it used to be. These days, you don't have to be in the same conference room — or, heck, even time zone — to work side by side with co-workers. Thanks to the variety of top-notch collaboration tools for our ever-connected devices, you can edit, organize, and communicate with anyone as if you were sitting right next to them, no matter where your corporeal form resides. And you don't even have to be perched at a computer for that to hold true: With the right set of Android apps, you can put the power of collaboration into your pocket — ready to jump into action anytime, anywhere. 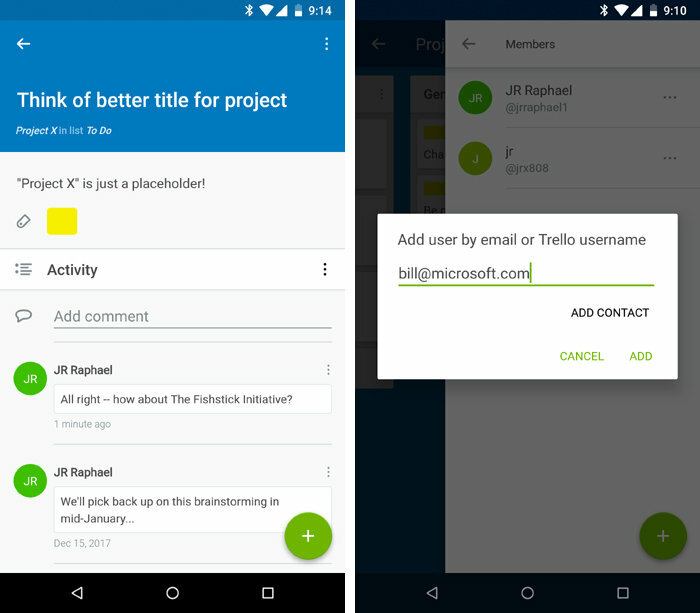 These are the best Android apps for effective and efficient collaboration, broken down by what they'll help you do. For years, Microsoft neglected Android, with app offerings ranging from "barely usable" to "entirely nonexistent." Even as recently as last year, when the company had finally started taking Office for Android seriously, the software's real-time collaboration feature was vexingly clunky and inconsistent. In 2018, all of that is history. 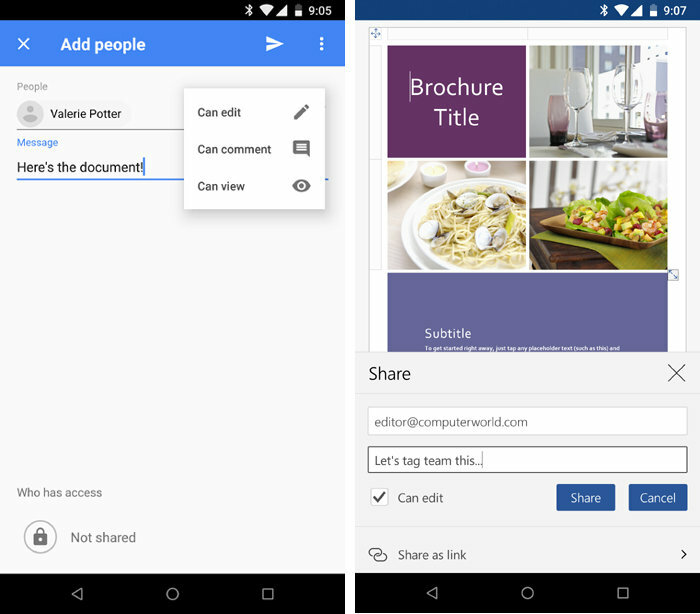 Microsoft Word on Android is now a delight to use — and its multiuser editing system is smooth as can be, with real-time changes and inline commenting fully functional across multiple platforms. That puts it neck and neck with Google, whose Docs word processor has always excelled at collaboration and continues to serve as a shining example of simple multiuser support. Inviting others for collaboration in Google Docs, left, and Microsoft Word, right. The only real question is which app you prefer and which ecosystem makes more sense for your professional needs. Docs is free for individuals' use, with company-wide plans starting at $5/user/mo. Word is similarly free for individual use, though with some significant restrictions in place — like read-only access on large-screen devices. Its fully featured plans are $70/yr. and up for individuals or $5/user/mo. and up for businesses. When it comes to note collaboration, Evernote has a chiseled leg up on the competition. 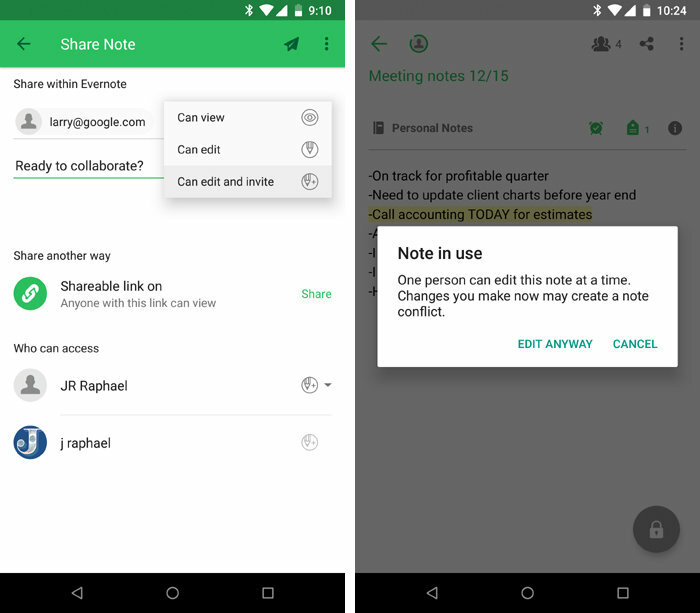 The Evernote Android app makes it easy to share notes with anyone and control exactly what level of access they're granted — viewing, editing, or both editing and inviting other collaborators. You can even opt to share entire notebooks with other users if you want. Evernote doesn't have real-time multiuser editing; instead, when another user is actively editing a note, the app will warn you against opening it in order to avoid cross-edit conflicts. If you're looking at a note while it's being edited by someone else, though, you'll usually see their changes appear on your screen within seconds. Evernote makes it painless to add collaborators, though only one person can edit any given note at a time. Factor in Evernote's advanced text-formatting options and the ease with which it allows you to add files, emails, and web pages into your notes, and you've got a rock-solid foundation for note collaboration. Evernote's basic level of service — which lacks offline access from Android and limits you to a total of two devices per account and 60MB per month for note-related uploads — is free. For the full works, you'll have to pay a minimum of $35/yr. for an individual user or $12/user/mo. for a business-level subscription. Need to work with others on organizing ideas and tracking progress on projects? Trello is the Android app for you. Trello gives you a simple yet feature-packed canvas for keeping projects in order: You just create a board for each project or area of interest, then create a series of lists within each board. The lists then get filled up with cards — individual items that contain text, files, photos, and so on. Every card contains its own comment stream for co-workers to leave thoughts and ideas, and each card — as well as the board on the whole — has a detailed activity log that lists all comments, additions, edits, and invites in a single place. Trello provides comment streams in every card and lets you add more collaborators with a couple quick taps. Adding in new users is as easy as tapping a "Members" option in the app's main menu. There, you can invite anyone to view your board — with or without their own Trello account — and to join you in editing it, provided they have an account with the service (or are willing to sign up for one). You can also create a shareable link that'll let anyone view your project without the need for an account or invite. Trello is free, with optional $5-a-month subscriptions and business plans that unlock additional features such as larger file attachments, management capabilities, and unlimited integrations with other business apps. 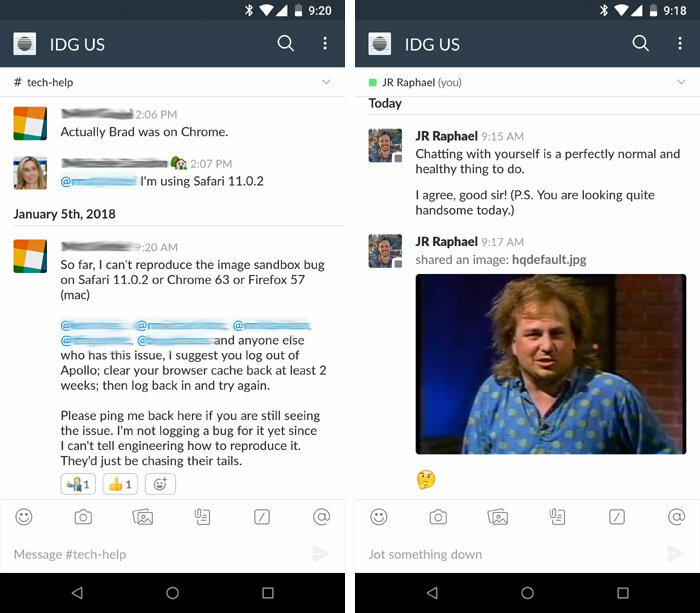 Slack has become the de facto communication service for companies and teams — and for good reason: The app provides a powerful, reliable, and easy-to-use system for keeping in touch with colleagues in almost any way imaginable. Slack gives you a combination of channels — subject-specific forums for specific members of your team — and private direct messaging capabilities to keep in touch with individual co-workers. It has customizable notifications so you can get alerted to activity as often as you like, with options for keyword-specific notifications as well as channel-wide activity alerts and pings for direct messages and mentions. Slack excels at both group chats, left, and more personal types of communication, right. With productivity-oriented integrations for everything ranging from Google Drive and Calendar to Salesforce, Zendesk, Evernote, and Trello, Slack is designed to serve as the central nervous system for all of your work-oriented communication. It's free with the most basic set of features (and some strict limits on both storage and integrations) or $8/user/mo. and up for unlimited use along with advanced features such as guest access and group video calls. Slack, Trello, and Evernote all include their own integrated file-sharing functions — but when collectively accessing files is a frequent part of your team's workflow, having a dedicated common folder can make your life easier. The good news: You've got plenty of solid options. 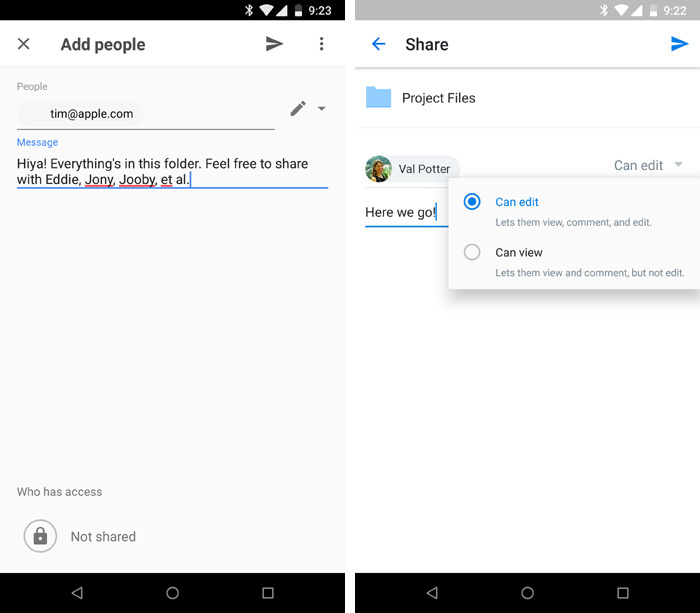 Dropbox, Google Drive, and Microsoft OneDrive all have simple functions for sharing individual files or entire folders from their respective Android apps. You can create shareable links that'll let anyone download the data in question — or you can share directly with other registered users to let them both access the data and upload their own additions. With the respective company's software in place, you can even make a shared folder look and act like a regular local folder on your desktop computer for quick drag-and-drop transfers. Sharing a folder with someone in Google Drive, left, and Microsoft OneDrive, right. Dropbox provides 2GB of space for free; Google Drive gives you 15GB of free storage that's shared across all Google services (including Gmail and Google Photos); and OneDrive starts you off with 5GB of storage at its free level. All three services offer options to pay for additional space and other advanced features, with business-level plans available as well. Google Calendar and Microsoft Outlook both do a commendable job of supporting shared calendars for colleague coordination. The main difference is each app's associated ecosystem — and also the fact that Microsoft's service comes bundled as part of its broader email application. Basically, if you're already using Microsoft apps — especially Outlook — then using Outlook for shared calendars likely makes sense. Otherwise, you're probably better off going with Google's standalone calendar service. Clichéd as it may sound, sometimes a picture really is worth a thousand words. (Or at least a couple hundred.) The next time you need a shared visual surface for long-distance collaboration, LiveBoard Interactive Whiteboard is the app to try. LiveBoard, as its name suggests, puts a blank whiteboard surface on your screen. You send a private link to whomever you wish to invite, and — whether from a mobile device or a desktop web browser — they'll be able to view and interact with your virtual board in real time. LiveBoard has all sorts of tools for whiteboard-like collaboration. 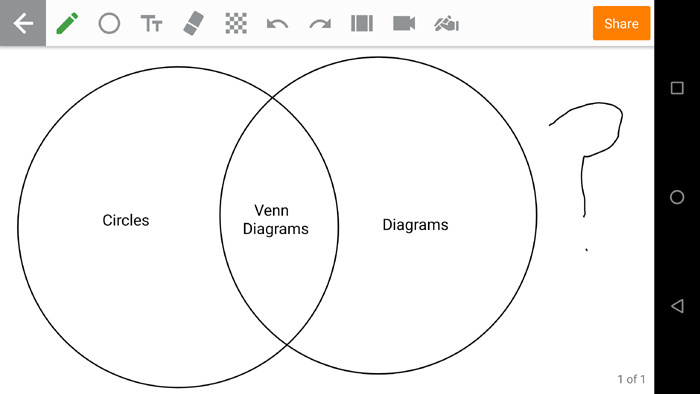 Together, you can create diagrams, sketch out ideas, and mark up and annotate images. LiveBoard makes it easy to export and save your boards when you're done, and it's completely free to use. Maybe you need more than a whiteboard. Maybe you want a colleague to see exactly what you're seeing on your own screen — something within an app, on the web, or whatever the case may be. 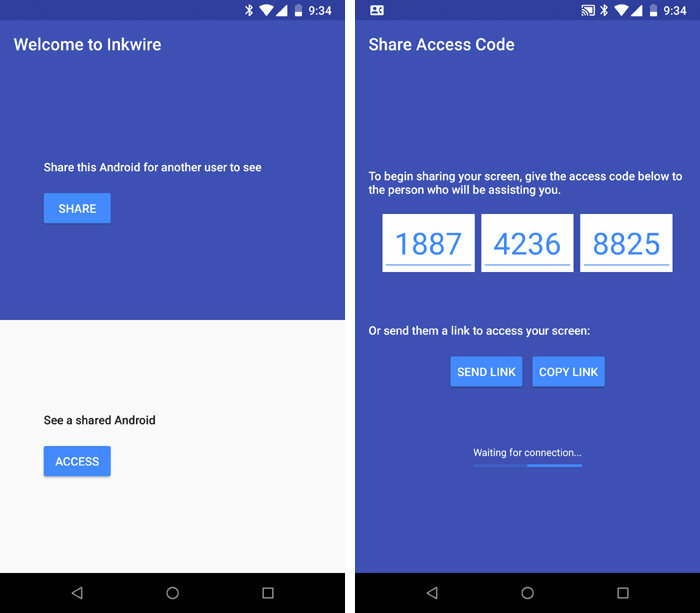 Enter Inkwire: The free app lets you generate a one-time-use code that you send to someone else. Once that person installs the app and inputs the code, they'll see a live view of your smartphone's screen on their own device. Only you can control your phone, but your remote observer can draw on your screen (as if they were using a laser pointer) and chat with you via voice at the same time. Sharing a live view of your screen is simple as can be with the aid of Inkwire. * But please do — at least once in a while. OK?